Basic instructions for how to assemble an easy vegetarian mezze platter - use shop-bought items, or use your favourite recipes to make them yourself. Feel free to add whatever extras you like - there are no rules! 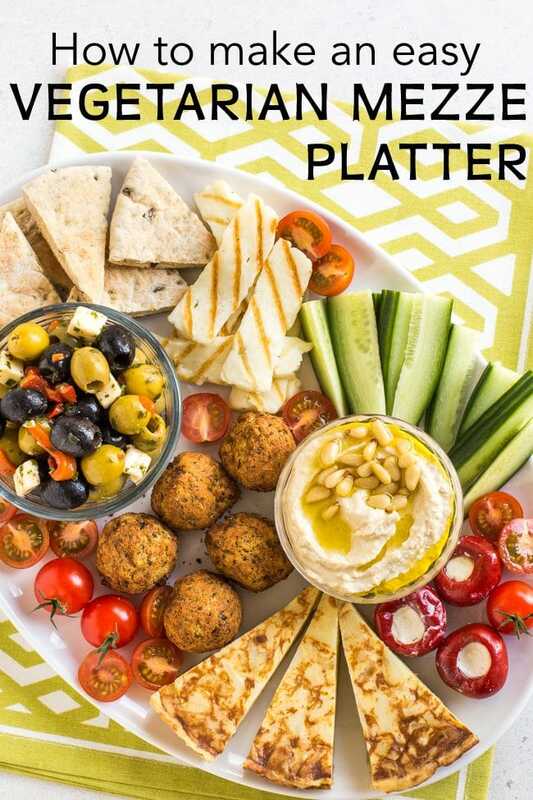 This easy vegetarian mezze platter is basically my ideal meal. 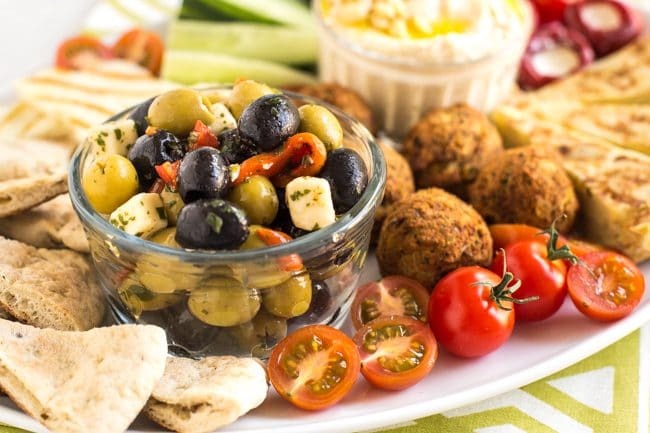 I absolutely love lots of little picky bits – olives, bread, dips, that kind of stuff. And since it feels like the spring has finally arrived (in fact it actually feels like summer! Bet you anything August will be cold and rainy), this is just the sort of meal I need. It takes very little effort but looks spectacular and tastes incredible! Perfect for serving up to friends with some cocktails or a big jug of sangria – it’s such a social meal that everyone can dig into together. 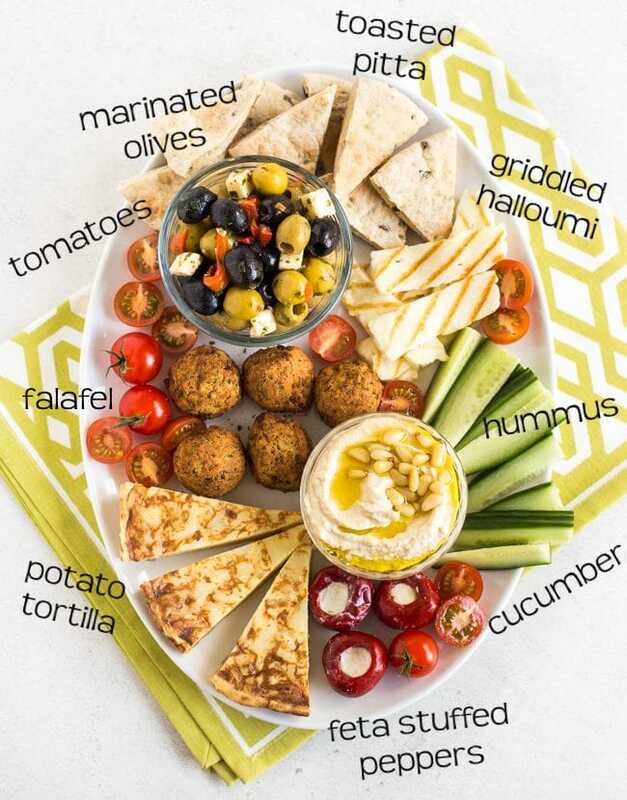 I used some shop-bought items to make my vegetarian mezze platter super quick and easy to prepare – shop-bought falafel, hummus, potato tortilla, that kind of thing. No shame here. Of course you can make everything from scratch if you prefer, but I think it’s pretty stunning either way, so personally I’d conserve my energy! What should I include on my vegetarian mezze platter? – …or anything else you like to nibble on! – To spruce up shop-bought hummus, swirl it with the back of a spoon, then add a drizzle of extra virgin olive oil and a few pine nuts. – For the most beautiful mezze, aim to include plenty of colourful items – fresh tomatoes and cucumber go a long way to brightening up the plate! They also help to balance out the salty or fried elements of the mezze. – If you’re including hummus, baba ghanoush, tzatziki, or any other kind of dip, make sure you provide lots of dippers! Cucumber sticks, wedges of toasted pitta, and fingers of griddled halloumi cheese all work well. – You can also provide some cocktail sticks to make the marinated olives easier to pick up. – Make sure you cut each item into bitesize pieces (or at most two or three bites). The point is for people to pick at lots of small bits – bitesize wedges of pitta bread are better than whole pittas, for example. 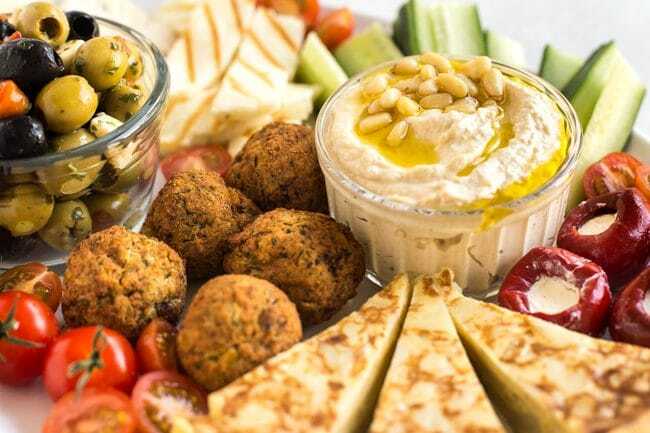 – For a bit of variation, it’s nice to include some cold items (potato tortilla, olives, dips), and some warm items (griddled halloumi, falafel, toasted pitta bread). – Halloumi cheese is best eaten straight after cooking, as it gets a bit squeaky as it cools (which I like, but not everyone does!). Prepare everything else before you start on the halloumi. – Check out my post about how to cook halloumi perfectly – use a griddle pan if you want those beautiful char lines! 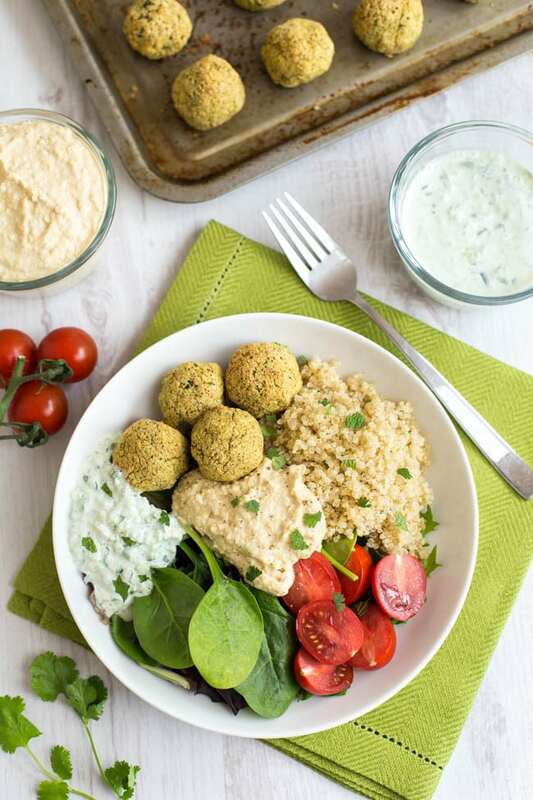 – If there are any gaps on the plate once you’ve added all of the elements to your mezze, fill them in with cherry tomatoes for a full, impressive platter. I like to use both whole and halved cherry tomatoes to add a bit of interest. – If you don’t have one big platter to use for your vegetarian mezze, use lots of small dishes instead – more like tapas. So there you have it! I’ll put my ‘recipe’ below, but it’s not really a recipe, just an assembly job, and of course you can adapt it however you like. 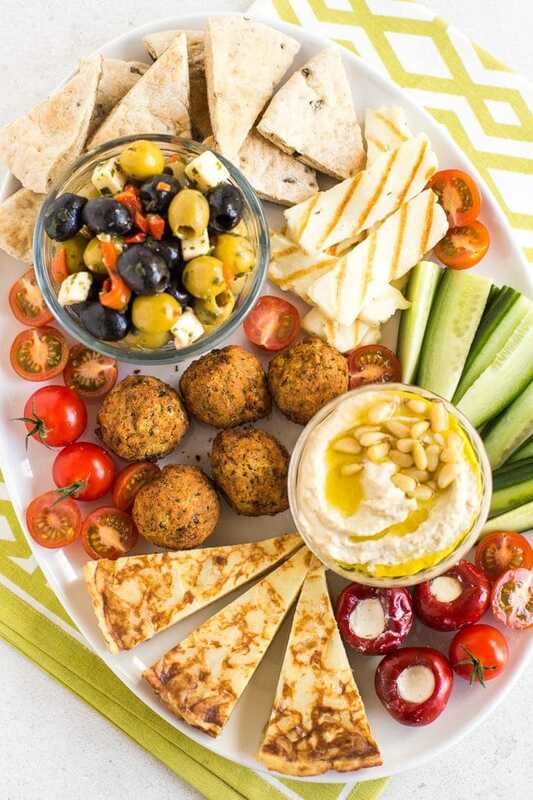 I can’t wait to make another of these vegetarian mezze platters, get a jug of sangria on the go, and sit in the garden sipping and nibbling for hours on end. Heaven! To spruce up the hummus, swirl the top with the back of a spoon, and add a dash of extra virgin olive oil and some pine nuts. Place on the platter. Add a bowl of marinated olives, a few thin wedges of potato tortilla, some cucumber sticks, and some feta stuffed peppers. Bake the falafel for around 15 minutes, until crispy, or as instructed on the packet. Toast the pitta bread under the grill (broiler), then cut into wedges. Add to the platter. Cut the halloumi into slices, and cook in a dry frying pan or griddle pan (you can find more details about how to cook halloumi perfectly here). Add to the platter. Fill in any gaps on the platter with cherry tomatoes, either whole or halved. 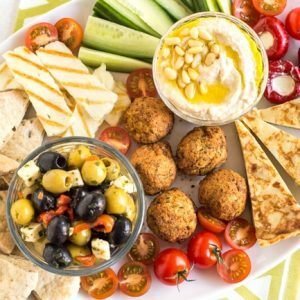 If you fancy making homemade falafel or hummus for your vegetarian mezze platter, here are my recipes! I call this a snacky plate meal! I’m vegan and like to have slices of smoked tofu (i swear it’s like smoked cheese! 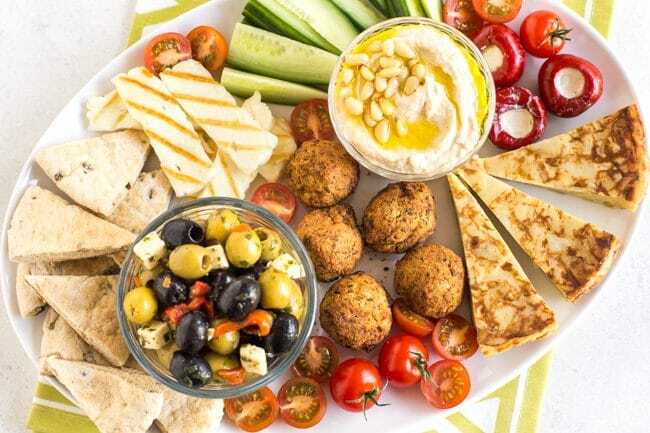 ), lots of veggies, babaganoush, olives, some sturdy seedy crackers and of course a glass of wine :)) perfect for picnics and hot summer nights too. Oooh smoked tofu sounds so good! I love eating like this, just a mixture of all of my favourite foods to pick at. This looks so colourful and inviting. I would love to be served this! That looks absolutely wonderful, picky plates are the most fun to eat and you have filled your platter with such delicious treats. we love this sort of meal – Sylvia calls it take what you like! Last year we did a platter and I really loved using charcoal lavosh crackers – sadly the weather has turned away from such food lately so I am not quite in the mood but I do love a good platter. And I am glad you reminded me of the dolmas – I always forget about them but they are a great addition. Ahh the weather here has been glorious the past few weeks (though not so much today!)! Perfect for this kind of meal. This is Cooper’s favourite dinner. He calls it buffet. I add more crunchy vegetables and usually add some crisps and fruit too. I have to admit I love this type of meal too. Love your platter. I could dig into it right now!